The governor of Illinois, whose family started the Pritzker Prize, is set to sell Helmut Jahn‘s James R Thompson Center in Chicago, putting the fate of the postmodern building in “serious trouble”. Jay Robert Pritzker signed a bill on 5 April 2019 paving the way for the sale, and likely demolition, of the German-American architect’s massive 17-storey structure. Pritzker was elected to office on 6 November 2018 and is part of the philanthropic Pritzker family. His father Donald Pritzker is the brother of Jay A Pritzker, who established the revered architecture prize in 1979. His signing of the bill forms part of the continued controversy surrounding the fate of Jahn’s Thompson Center. Completed in 1985, it is celebrated as one of the city’s best examples of postmodernism – an architectural style developed in the late 1970s as an ideological reaction against the utopian ideals of modernism. Despite this, the building is not titled as a historical landmark, and thus protected from future sale or demolition, which has resulted in the recent bill. 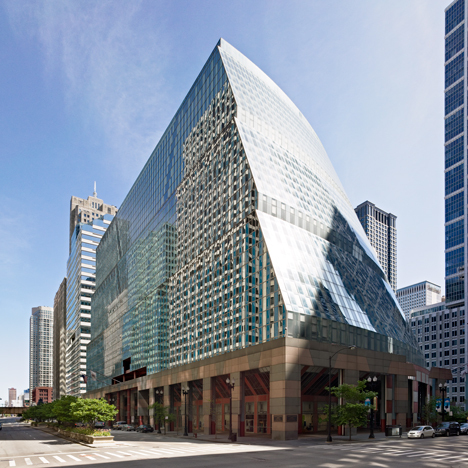 “The Thompson Center should be landmarked, period,” filmmaker Nathan Eddy told Dezeen. In 2015, he captured the building in a video in a bid to reinforce the architectural importance of the building to Chicago’s heritage, and to protest to its projected demolition. “The building is unquestionably an architectural landmark of the first rank, according to the Commission on Chicago Landmarks’ own guidelines,” he added. 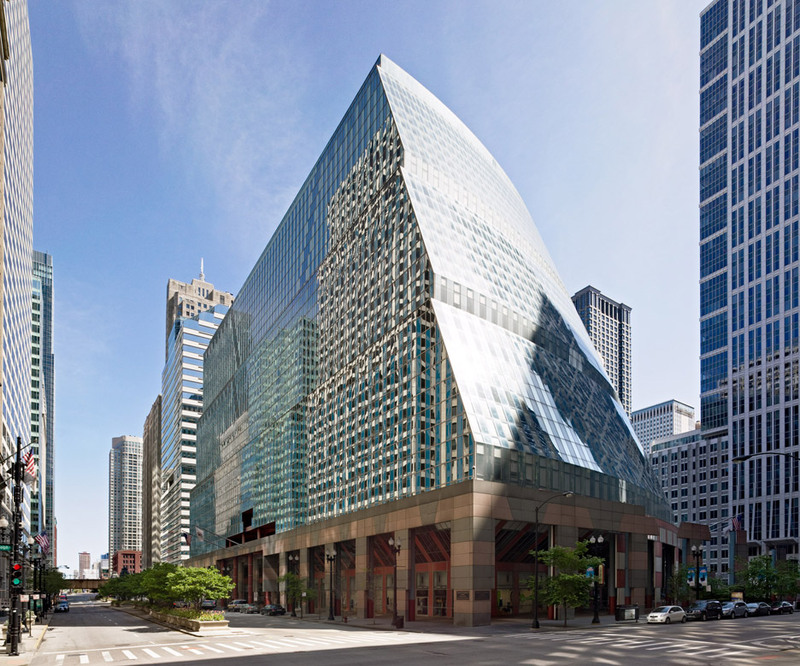 The threat to the Thompson Center is part of growing awareness for the need to preserve postmodernist buildings, which have only recently been able to be deemed historic. Requirements for buildings in the US to be landmarked and preserved state that structures must be historically significant and at least 30 years old. Then, a submission for the building must be sent and approved in order for it to be recognised. Nicknamed The Spaceship after its futuristic shape, Jahn’s 30-year-old structure makes the historical landmark mark with five years to spare. The building also has a number of standout architectural features, such as sloped glass walls that gently slope and protrude down to the base. A sliced dome tops the building to create a large window to the central atrium inside. Eddy also highlights the building’s importance in the city’s community activities. “The Thompson Center represents a watershed moment in Chicago architecture and has been a singularly spectacular public space has been home to fundraisers, mariachi bands and civic ceremonies every week,” he said. Pritzker’s signing of the bill comes at a time when the historical importance of postmodern structures, such as the Thompson Center, is hotly debated, and most often argued for. New York’s AT&T was recently landmarked to spare a dramatic overhaul by Snøhetta, while James Stirling’s postmodern No 1 Poultry was granted listed status in Britain in 2016 and many more postmodern buildings were listed after. Venturi Scott Brown’s postmodern Sainsbury Wing at the National Gallery in London also won the AIA 25 Year Award this year. For years, Thompson Center has served as a government building at 100 W Randolph, housing offices of the state of Illinois. Single-paned and non-insulated curved glass panels cover the exterior, which has proven expensive against an air conditioning system. It remains very costly to operate. “This building is ineffective,” said governor Bruce Rauner in a 2017 news conference. Other people who believe it important to keep the postmodern building argue that it is more efficient to replace the centre’s HVAC system and glazing, rather than waste money and energy in tearing it down. Signed on Friday, and effective immediately, the bill provides the sale of Jahn’s project. The legislation was first passed in 2017 by the Illinois General Assembly. In order to purchase Jahn’s building however, the buyer must enter into an agreement with the city and the Chicago Transit Authority. Chicago’s Clark and Lake metro station is accessed from the Thompson Center, and it is one of the busiest and most intricate stops in the city. Chicago’s politicians have received a lot of criticism lately. Helmut Jahn, in particular, scolded the city’s decision for Studio Gang to design the city’s new airport, pointing blame at mayor Rahm Emanuel. Emanuel will be succeeded by Lori Lightfoot in May 2019. Photography is courtesy of Jahn. The post Pritzker to sell Helmut Jahn’s postmodern Thompson Center in Chicago appeared first on Dezeen.